Bayer CropScience is set to register a new agricultural insecticide, Belt® 480SC Insecticide for the Australian vegetable market in early 2009. This product presents a new mode of action, eliminating cross-resistance issues for growers, marking a significant breakthrough for the Australian vegetable industry. 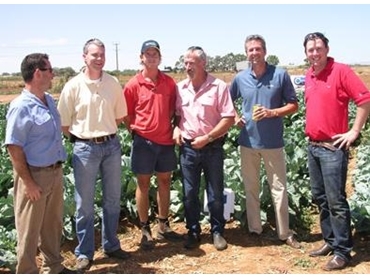 Robert Masters, Bayer CropScience Global Product Manager and Global Development Manager, Shane Hand attended recent Belt demonstration trials across the country to discuss the results with key resellers and growers in the vegetable industry. “It’s great to be able to chat with growers and resellers to understand the issues they face locally. The registration of this insecticide will be welcomed in the vegetable industry, particularly given the unique integrated pest management properties this product possesses,” said Robert. With registration intended for brassicas, tomatoes, sweet corn, capsicums, lettuce and green beans, Belt will have a broad label and will be a crucial product in controlling chewing pests including diamondback moth, heliothis, cabbage white butterfly and potato leafminer. Ben Hoodless, Market Manager, Plantation Crops & Vegetables said that Belt has been part of the Bayer global pipeline for almost ten years, with first trials conducted in 2003 in Australia. ‘We are extremely excited about Belt which represents the next generation of lepidopteran insecticides into the Australian vegetable market. Belt ticks all the boxes of a modern crop protection product, he said ‘It has a new mode of action providing excellent efficacy on key lepidopteran species, it is suitable for use in an IPM program and has short withholding periods providing flexibility for the grower’. “We’re looking forward to a renewed focus on the vegetable segment here at Bayer CropScience, Belt is the first of a series of great new products for the industry in our pipeline, It’s an exciting time for Bayer CropScience and the vegetable industry as a whole,” Ben concluded.